Today I'm working on a couple of reader requests I've received recently. 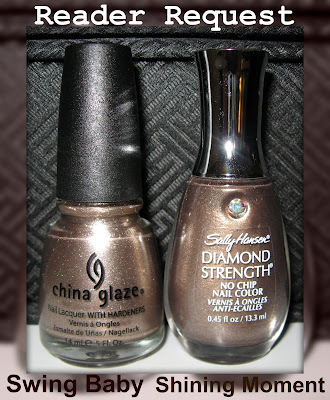 First up, is a comparison to a polish I showed you yesterday, Sally Hansen Shining Moment compared with China Glaze Swing Baby. Above: The certainly seem to be similar based on the bottle appearance. Below: Upon closer inspection (click to enlarge), you can see the differences. 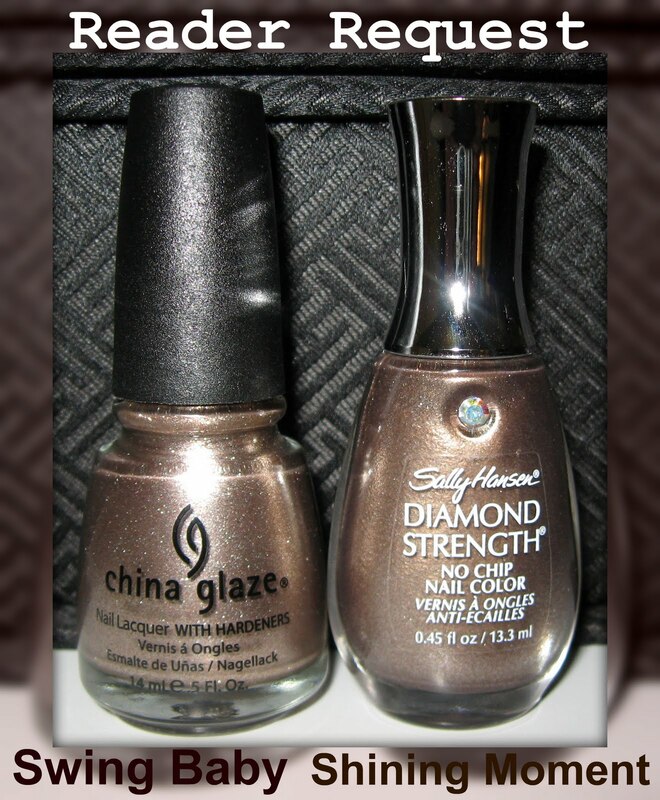 China Glaze Swing Baby is more silver and Sally Hansen Shining Moment is more golden/taupe. The glitter in the China Glaze polish is also more pronounced. Both shades are shown using 3 coats in varying degrees of outdoor lighting. Below: This is kind of odd to show you the cotton ball comparison after removing them, but I always get a better idea of a polish base coat by examining the product in such a way. As you can see, Shining Moment (left) has a much greater concentration of taupe and less glitter. Swing Baby has a more grey base and quite a bit more glitter. Thank you to the reader who requested this comparison, and I hope it helps you out! I will also be doing a request from a reader who would like to know if Orly Space Cadet, Milani Dot Com, and Sally Hansen Purple Gala are different enough that she needs them all. I've had quite a few requests asking just how close China Glaze Channelesque is to one of the new shades in the China Glaze Spring 2011 Anchors Away Collection, Below Deck. It is rumored that they are dupes, and from looking at the swatch that Yen from VNS sent me and my bottle of Channelesque, there does seem to be a lot of truth to that rumor. It's interesting to answer reader requests with photo comparisons, because it allows me to learn more about the differences and similarities between certain polishes that I may not have necessarily thought of or realized. If there's something you'd like to see, feel free to let me know and I'll do my best to check it out. Oh thank you so much! You're the best! I think I'll go with the China Glaze one if I can find it at my Sally's if not then I'll just get the Sally Hansen one. This really helped. Thank you again! I'm amazed how anyone remembers what each polish looks like. Then to know about a dupe! Good for the rest of us. It's really helpful to know about dupes. Good idea, no terrific idea to show the cotton! You can really see the difference. I know I much prefer the China Glaze.